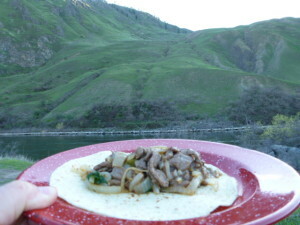 Hells Canyon Fajitas near Pittsburg Landing, White Bird, ID (45⁰37’20.00” N 116⁰28’11.66” W). This is our go-to recipe that we usually do on the first night since it includes meat. It is easy, quick, and a breeze to clean up. You may not even need plates since the tortilla makes it perfect to eat…and you can dribble all over, the dogs will love it. You can also make variations by adding other items, like corn or mushrooms, etc. 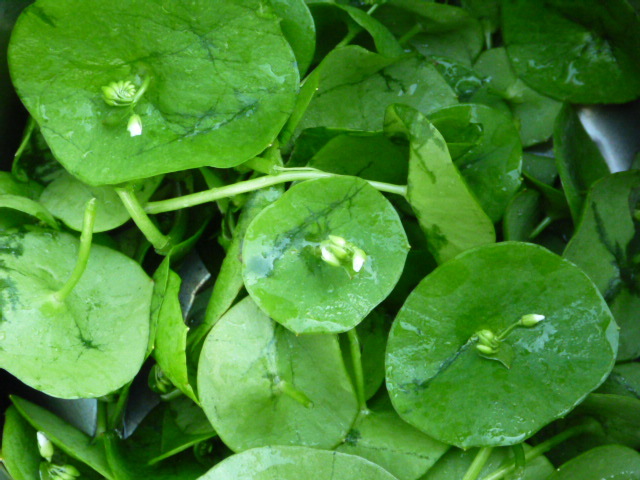 On our trip to Hells Canyon, we found some miners lettuce on our hike and added it for fun – be creative. An added mystery ingredient on this trip was miner’s lettuce (Claytonia perfoliata), a rosette-forming succulent plant named after California gold miners who used it to supplement vitamin C to prevent scurvy. Prepped ingredients…the top of the plastic tub makes a great counter. Heat the oil in the skillet, add onions, peppers, garlic, and half of the spices. Sautee until onions are translucent, put aside. Since this is a two-step process using one skillet, season both batches, it provides more flavor rather than waiting til the end. Chef Andy stirring the pot. Next, brown the batch of meat. You may need to add a little bit more oil and the other half of the spices. Cooking goes quickly (5-7 min. 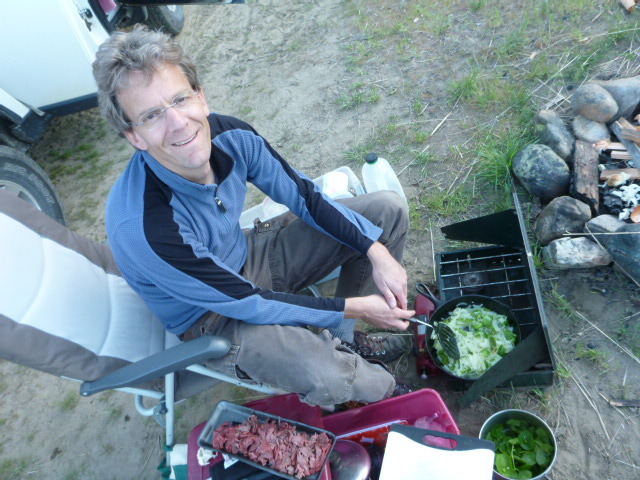 ), don’t overdo the meat. 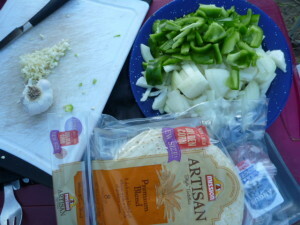 When almost done, add fajita mix spice packet, maybe a little dab of water, and finally stir in the onions and peppers from the first batch as well as the green onions and parsley. BTW, I’m a parsley addict so it goes into everything, period. Hold it – before turning the stove off, slap some tortillas on the grate to warm them up and you are ready to go.